This is a basic recipe for meatloaf. I dressed it up a little though. I didn’t have 1 1/2 pounds of ground beef in the freezer but I did have 1 pound and I found 1/2 pound of ground veal. Mixing two different meats together was really good. A 1/2 pound of ground pork would be good too! The thought of adding 1/2 pound of venison crossed my mind but I decided not to since I like to eat venison with spicier ingredients to hide that wild taste. Some people probably wouldn’t mind it though. I put everything else in the meatloaf as the recipe calls for except I had 1/2 of a green and red bell pepper leftover in the refrigerator that just seemed to be crying out to me. So I chopped those up and put them in the meatloaf. 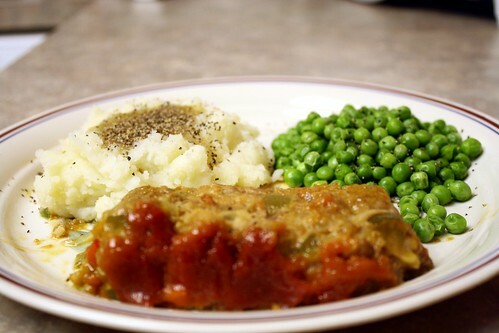 Most leftover veggies go well in meatloaf. This recipe was enough for supper for hubby and I and then sandwiches for lunch the next day. Half of the meatloaf was still leftover so I put that in the slow cooker spaghetti the following morning. This meatloaf could easily feed a family of 4 with enough leftovers to make spaghetti the next day minus the sandwiches. I served the meatloaf with mashed potatoes and gravy and peas. Yummy! Preheat oven to 350 degrees F. In a large bowl, combine the beef, egg, onion, milk, and bread or cracker crumbs. Season with salt and pepper to taste and place in a lightly greased 5×9 inch loaf pan, or form into a loaf and place in a lightly greased 9×13 inch baking dish. In a separate small bowl, combine the brown sugar, mustard and ketchup. Mix well and pour over the meatloaf. Bake at 350 degrees F for 1 hour. Posted on January 12, 2014 by cookingwithpizazzPosted in Beef, Freezable, Leftovers, Main DishesTagged Beef, Food, Freezable, Leftovers, Make Ahead, Recipe.